SCULPTURAL BUILT-IN FIREPLACE Equipped with a rusted raw steel door frame (thickness 15 mm) that opens on side hinges, an integrated hearth of firebricks and an interior glass door that opens on side hinges as well as slides open. The Metafocus weds thermal efficiency with the visual power of a concise, sober Japanese ideogram. Each unique façade is numbered and signed by Dominique Imbert. This model is integrated in masonry. It consists of a closeable hearth with a door frame in rusted raw steel hung on side hinges (H 1.15 m X W 1.08 m). Its firebox complies with the DIN+ standards: the strictest European technical and environmental standards. 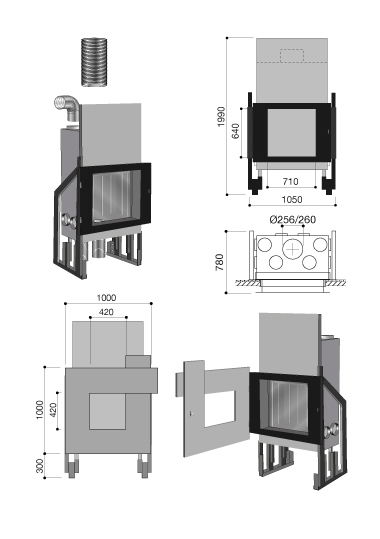 Guaranteed efficiency with a minimum flue length (interior plus exterior) of 4,50 m.